An elegant, versatile player who celebrated Premierships at Under-19 and Reserves level during his first few seasons at Princes Park, Graham Gilchrist went on to play more than 100 senior games for the Navy Blues in two different guernsey numbers between 1952 and 1961. 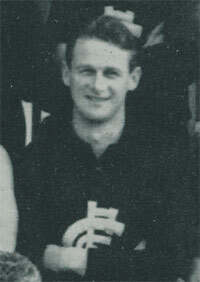 While studying at Coburg High School, Gilchrist joined Carlton’s Under-19 squad in 1949. Two years later he was appointed captain, and led his team to a grafting Grand Final win over Essendon. Agile and strong in the air, he often played at centre half-forward in his early days, until it became obvious that he was better-suited to the centre or a flank. In August 1952, Graham was rewarded for his consistency at Reserves level by gaining senior selection for Carlton’s clash against St Kilda at the Junction Oval, in the second-last round of the year. In the number 26 guernsey previously worn by dual Premiership defender Jim Clark, he showed his wares in a strong victory by the Blues, but had to be content to return to Reserves level the following week. In 1953, he switched to guernsey number 28 and again spent the season almost exclusively with the seconds, as an understudy to incumbent wingers Laurie Kerr and Johnny Chick. When Chick tore a groin muscle in mid-August, Gilchrist was called up for the last two matches of the season; against Hawthorn and North Melbourne respectively. He kicked his first career goal against the Kangas, before rejoining the Reserves for their finals campaign. On Saturday, 26th September 1953, Carlton seconds won their fifth lower grade Premiership by defeating Essendon in front of 80,000 fans in the Grand Final curtain-raiser at the MCG. Gilchrist played well across half-forward that afternoon, kicked two goals, and staked his claim for a regular place in the seniors throughout the following eight seasons. Graham was unfortunate in that Carlton was a mediocre team for most of his career, and he played only three senior finals in his 114 games, including the 1957 first Semi Final loss to Hawthorn, and the 1959 Preliminary Final defeat by eventual Premiers Melbourne. Still, his pace, balance and smart disposal made him one of the first selected each week throughout his time at Princes Park, and he was always popular with his team-mates and fans alike. He notched up his 100th game against Collingwood at Victoria Park in round 8, 1960 – sharing the milestone with defender Denis Zeunert – and finished up after a remarkable contest against Melbourne in round 18, 1961 at Princes Park. On that blustery afternoon, lowly Carlton led Premiership contenders Melbourne by 20 points at three-quarter time, and were on the verge of causing a boilover. In the centre, Gilchrist had the better of his opponent Laurie Mithen for three quarters, before the Demons charged home with a strengthening wind at their backs to pip the gallant Blues by one point. As well as bidding farewell to the VFL that day, Gilchrist kicked his 26th and last goal in Navy Blue. Carlton finished out of finals contention in eighth place on the ladder, but the clubs’ spirits were lifted enormously when star defender Johnny James won the Brownlow Medal, and first-year full-forward Tom Carroll was the League’s leading goal-kicker, with 54 majors. Contributors to this page: Bombasheldon , PatsFitztrick , tmd1 , molsey , WillowBlue , pblue , Jarusa , nikki and admin . Page last modified on Monday 06 of May, 2013 21:58:56 AEST by Bombasheldon.